We surely have something thrilling coming our way, the makers of 'TE3N' have finally released it trailer and it’s something that you can't miss. This two and half minute trailer is on beautifully, gripping and fantastic one. In the trailer you can see, Big B essaying the role of a grandpa who's battling to get justice for his kidnapped grand-daughter Angela. 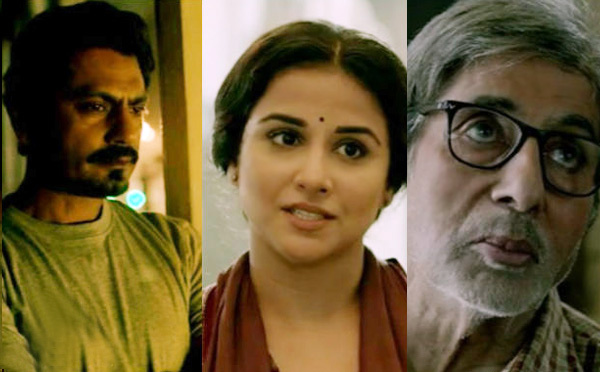 Vidya Balan is a tough cop, who investigates the case while Nawazuddin Siddiqui is the priest up for redemption. These three characters are caught in a similar incident that is repeated after 8 years. What is it and where does the story lead to, is what you have to watch. So fans, be ready for 'TE3N' that promises to be an incredible thriller movie that will make you glued to the seat. How can we forget Sujoy Ghosh's hit movie 'Kahaani' that gave us goose-bumps throughout. Hope this does the same too, because the trailer looks promising. This movie 'Te3n' is directed by Ribhu Dasgupta and is an unofficial remake of Korean thriller movie 'Montage'. This movie will hit theatres on 10 June 2016. Sushant Singh Rajput & Dhoni to work together?